I've taken the pledge and this blog will go orange after Easter. 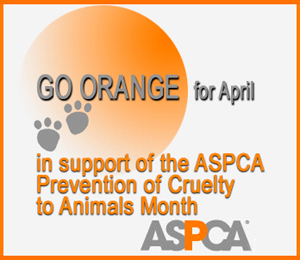 Click on the image to see all the ways you can go orange to stop animal cruelty, courtesy of the ASPCA. click on the gadget in the sidebar to sign the pledge. Orange is NOT a popular color in this condo but animal cruelty is even less popular. In our area, if you wear Orange at this time of year, it means you're a Mutts, er, Mets fan and we certainly are not. Orange is also a color of the NY Knicks and we're not Knicks' fans either. I'm putting all that aside to show my support in the fight to stop animal cruelty and abuse. 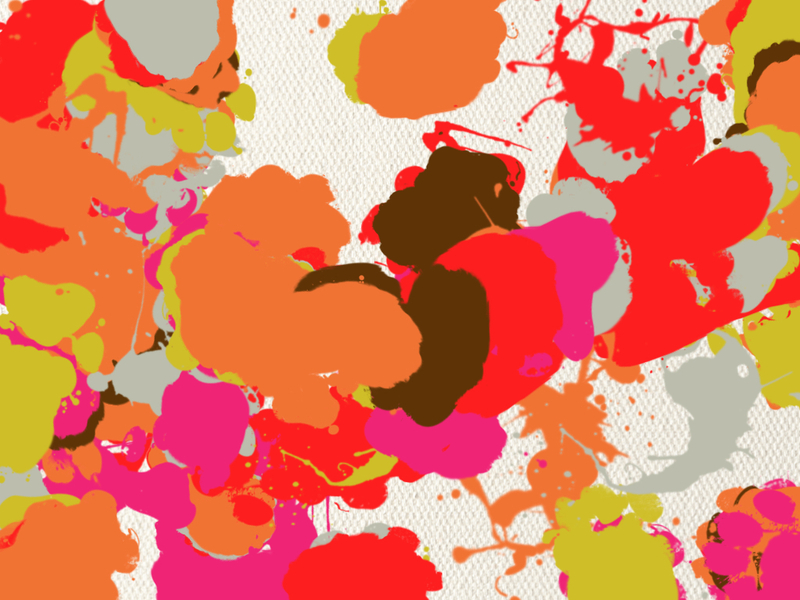 To honor the ASPCA, I've even gone Orange in my latest painting. I'm gonna relate a story about Karma that I've already told some furrends. A long, long time ago, Gramma looked out the window and saw a neighborhood kid banging a paper bag against a wall. Then she saw there was a little cat in the bag. She screamed out the window at the kid. Some 15 years later, the peeps attended the funeral of this kid, who had turned into a nice, young man. At the age of 21, someone pushed him off a 19th story balcony to his death during a St. Patrick's Day party. The peeps felt very sorry for this young man and his peeps but couldn't get the image of him on that day—and the pain of that kitty—out of their heads. UPDATE: Please read Bunny's Blog about the situation at Loew's Orlando Resort, then sign the petition. I've said it once and I'll say it again, Florida is the most embarrassing state in the Union. What does it take to get a murder conviction or an animal abuse charge there? CORPORATIONS ARE NOT ABOVE THE LAW! Nice of you to put the word out against animal cruelty. Difficult to believe you really have to keep telling people this huh? Your paintings are very nice. You have so many talents! Your painting is gorgeous. Your peeps might redecorate a room using a little orange so that your latest work of art can hang on its wall. You're so very talented. We are sorry that boy died, but how very very sad that he was so cruel to the kitty. We went orange for sure and the cruelty must stop! Thanks for going Orange even though it isn't a favorite color of yours. That is a horrible story about that child and the bag. Yikes. Take care. How very nice to meet you! Thank you so much for your kind words when you visited our blog to offer condolences for Scooby. You mentioned and embolism in your cat, that is exactly what the vet told me was a distinct possibility (or an aneurism) causing a moment of extreme fear and disorientation. He said he probably went into shock quite quickly and had very little if any pain. That is a comfort. Thank you again for coming to comfort us. The Cat Blogosphere is a truly wonderful place in how we all support one another. Paws up for going outside your color zone and going orange this month, CK! I read the Loews story earlier and got so upset. I'm glad these poor kitties are getting help. We support orange! Our Mommy says anybody that will be mean to any animal will be mean to a human being. My Human thinks really, bad, horribly awful, terrible things about people who deliberately hurt animals. It's a good thing she is not in charge of courts or anything. Or maybe it's not!! She isn't very vengeful about much but her blood boils at stuff like this. We going Orange after Passover too! And we think what's happening in FL is animal cruelty!! Great post Cathy Keisha, we have already signed the petition concerning Loew's Orlando Resort, we feel so sorry for the poor cats there. Thank you for taking a stand against animal cruelty, CK. We signed that petition against evil Loews! Chin ups! Yeah, chin ups! That's my story and I'm sticking to it! That is such a sad story about the kitty. We like your orange painting CK.